Ever since Sabrina was a child she loved animals and was rescuing at a young age. She brought home stray and injured animals to keep as pets or nurse back to health. Word of mouth traveled through family and friends and soon people were calling her for help with strays or medical problems, or bringing her found kittens that needed nursing and eventually a home. She never said no or turned anybody away even if she was overwhelmed with the cats she already had. She knew she needed the help of volunteers and financial help from donations so she got the idea to form a rescue group. For years, her dream has been to have her own nonprofit animal rescue and came close to achieving that dream in 2009. Much time and energy was put in to starting a dog and cat rescue with her partner at the time, but due to circumstances beyond her control, it became impossible to continue. Now Sabrina is starting over on her own, with the help of her friend and fellow vet tech and rescuer, Christina, who she met working at an animal hospital in Suffolk county. For years she have been rescuing on her own with her own money, but it is very difficult for one person, so with the help of Christina and some dedicated friends, she started Destiny’s Hope Cat Rescue, inspired by her daughter, Destiny. Sabrina’s own animals have all landed in her lap by a twist of fate. They include a pit bull named Gravity, an Australian shepherd named Fluffy and a few personal cats and the rescued cats that are up for adoption, but treated as members of the family and living in a house setting. This makes them more social and the transition to a new home will be faster and easier for them. Sabrina’s dog Gravity was dumped at the Islip town shelter and picked up by the Suffolk Community College Veterinary Technician program where she was spayed and vaccinated. The dog was destined to return to the shelter which was full of pit bulls, many who do not get adopted and are euthanized. Sabrina adopted her, saving her life, and she is a wonderful pet. Fluffy was an unwanted dog who was surrendered to an animal hospital when her owner could no longer care for her medical conditions and energetic personality. In her limited spare time, Sabrina participates in the trap, neuter, return program to help reduce the number of feral cats being born. See our section on TNR for more information. Sabrina traps neuters and returns feral cats from local people who ask her to help them as well. She and Christina also volunteer for all day spay/neuter of feral cats marathons doing surgical preparation and assistance. Sabrina’s daughter Destiny has been involved with the animals since she was able to walk and has inherited Sabrina’s love for rescuing. 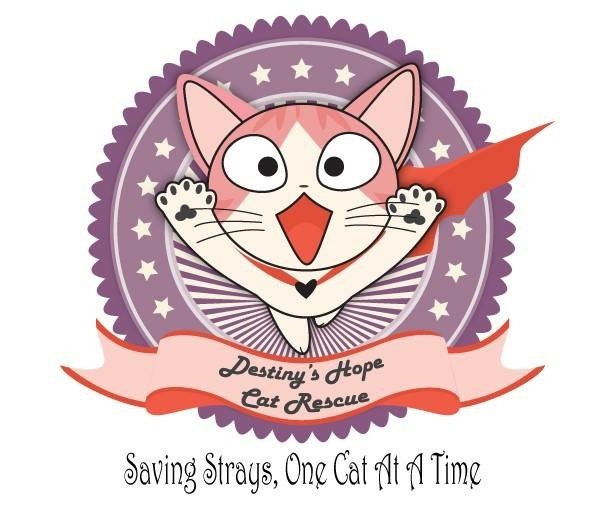 Destiny helps with the cats and her creative nature has helped form the rescue logo and t shirts. Rescuing animals takes a toll on the person’s emotions and Sabrina has gone through some tough times. When life is difficult and she loses her motivation, Destiny and the cats inspire her to keep going. The reward of seeing a neglected, sick cat turn into a happy family pet is worth it. Nothing would make her happier than achieving her dream of Destiny’s Hope getting approved by the state for a 501c3 nonprofit corporation. This would be the culmination of years of hard work and the dedication of family and friends who have helped her, so please join Destiny’s Hope for our fundraiser or donate to our cause so Sabrina can keep rescuing and provide the best care for the cats who come to her. The first thing Christina wanted to be when she “grew up” was a veterinarian. 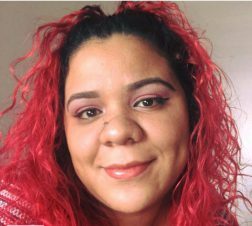 As she grew older, her love for animals only increased until the time when she realized that being a veterinary nurse was better suited for her. She loves the hands on treatment that is needed for a job like a veterinary technician. She can provide my patients with comfort and love as well as the medications he or she needs. She currently works at an animal hospital on Long Island, NY, and her favorite area of her work is emergency and critical care. She has three dogs, two Dachshunds and an American Pit Bull terrier. One dachshund she adopted from a shelter she was working for at the time, her other dachshund was adopted from a kill shelter upstate when he was 8 years old. 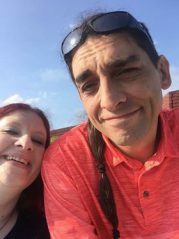 She knew he had a medical condition, but did not find out what an exam revealed a liver disease and diabetes which resulted in glaucoma and him going blind. He is much loved now and has a great life and acts like a healthy dog. Her pit bull was found as a stray in the city by a woman who volunteered for a cat rescue. He was about 5 years old and a male, and had a wonderful temperament despite his large size and tough, intimidating appearance. He was found to have been neglected for some time, with bones sticking out everywhere, worms, a poor hair coat and damaged knees. Multiple surgeries were needed for tumors that came up. Shortly after the last one, he was found to have a large tumor on his spleen and had surgery to remove it. Not long after that, he was diagnosed with a tumor on his liver than ruptured and was bleeding into his abdomen. Christina was told he would only live two days, but it has been over a year and he is doing great and added to her growing faith in rescue. Christina also likes small mammals, or “pocket pets” and has rescued guinea pigs, hamsters, rats and rabbits that needed homes in the past. She now had three hairless rats and a fish. Christina’s personal experience with her own animals has made her believe in rescue more than ever. She is reminded of her own animals when she is presented with a rescue that is ill, and wants to give every animal a chance. She believes they realize that if they make it through, they will have a wonderful home and they fight to recover. Animals are her passion in life, they have helped her through some horrible situations and will always be there for her, and she wishes every person has that comfort. That is why she does rescue. Cats, cats and more cats! That’s the first thing that’s brought Crystal and Sabrina together! They met working in an animal hospital together. Crystal started working in the veterinary field at the age of 14. Growing up loving animals, all she knew was that when she grew up she wanted to help save them all. Even though she can’t drive, she still does TNR and fosters. In her spare time she’s a avid drummer for over 15 years. She loves it!! She also does Petsitting in her spare time. Like we said, she loves animals. She loves to spend time with her 3 cats and dog. Going to the dog park is a regular thing with her and Friday! (Her dog) She loves everything from cats and dogs, to reptiles and birds. But she’s a sucker for a cat. 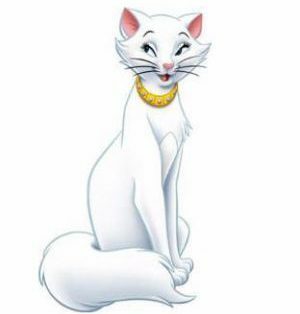 Her motto is, life is better with a cat! Krystle Parisi and Sabrina met in 2013 at a local animal hospital where they work. She is married with 3 beautiful children, julia (9), CJ (7) and Jianna (3) ! 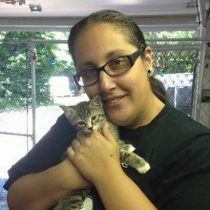 She started fostering to help Sabrina because her daughter wanted a cat who would stay little forever. She also owns 2 dogs and 1 cat; Brandy an 11 year old mini Australian Shepherd ,1 year old mix named Kiara who was rescued from A-team elite and and a cat who was rescued named Minnie kitty approx 6 years old. 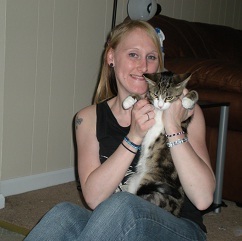 Minnie was Krystle's surgical lab animal in college ( where she was spayed and vaccinated). 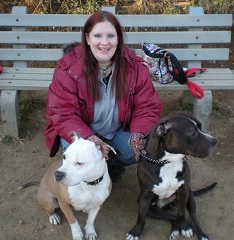 Krystle and her children love what they do and enjoy rescuing animals in need! Her foster home is located in Selden. Krystle is married to a wonderful man for 10 years named Chris! Sydney's love for animals began to expand and flourish at a young age. Her aunt would take her on outings to a local pet store and she would dream about the day she could eventually work with the animals. Her first pet was a sweet grey and white lop-eared rabbit named Jake. Sydney spoiled him to death, and soon thereafter added more to her growing animal family. After time progressed, she owned parakeets, lizards, turtles, snakes and her one only beagle, Layla Lou. At 14, Sydney got her first job working as a volunteer in an animal hospital. Sydney has since worked at a pet store and several other animal hospitals since then. She is currently working on her veterinary technician license in school. 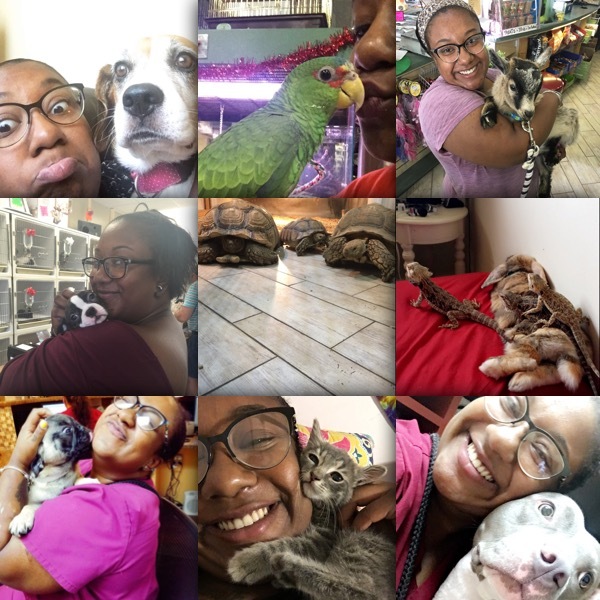 Outside of work and school, Sydney is a foster mom and is always looking for opportunities to advocate for the care and protection of animals. Sydney currently resides in Bayshore, NY. My name is Rose, I foster kittens in kings park. I have always loved animals and enjoying making a difference in their lives. I have 5 cats of my own all rescue. The one in the picture is teddy bear, I also have om, Holly, bubbles and river. I also have a dog named Cliffy and a tarantula named Nancy. Every organization needs those people who just make it their business to do what has to be done. No questions, no drama, just get it done. That is what Adam is to Destiny's Hope. Whether it's setting up sites, doing upgrade construction, changing cat litter or cuddling kittens, Adam can be counted on to be there. He's been with the organization from the very beginning and it can be safely said that he is part of it's backbone. Many things would be impossible to manage if it weren't for Adam! Sasha Rodriguez met Christina through Facebook. They had an instant connection, which was the passion for cats and animal rescue. She loves all animals, especially fostering for Destiny's Hope in her spare time. She works as a dog walker and pet sitter. Sasha has been rescuing animals since she was a child, rescuing birds with her mom in the winter and raising chickens. She could never see herself doing anything else besides working with animals. Danielle Davis is a resident of Lindenhurst, NY. She first met Sabrina when adopting her two cats a few years ago. 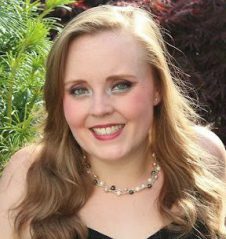 Danielle loves to offer her help whenever she can in designing the website (www.destinyshope.org) as well as flyers or social media graphics for events to such a wonderful cause. 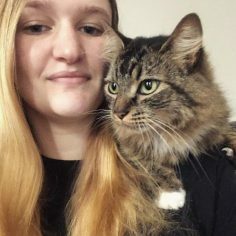 Being an animal lover her entire life, she advocates for animal rights, and is always willing to help fur-babies to find a perfect home or a home to find their perfect fur-baby. Ms. Davis is available at danielle.davis@hotmail.com. If you notice any glitches with the website, or would like to hire her for designing services, please feel free to reach her via email.